3 All the rollers are plated with chromium to encrease their hardness. 4 Spray circulated oil lubrication. 5 Return to zero and adjust printing plate automatically. 6 Module-designed. Multicolor printing sections can be combined as your requests. 7 The side baffle of feeder and slotter are all adjusted electrically. 8 PLC, frequency-variable controller are adopt,accurate and reliable. 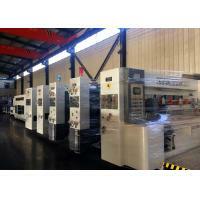 This machine is inclding Paperboard feeding unit , Printing Unit ,Slotting Unit , Die Cutting Unit , Stacker .